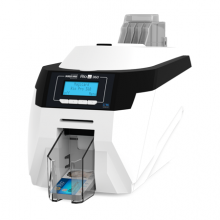 At ID Management System, we provide nothing but the best that is why we offer ranges of Magicard printers, which give a financially savvy answer for cutting edge ID card printing. 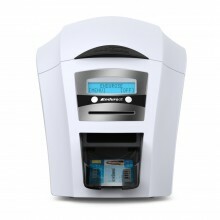 Select from single-sided and double sided models with your decision of direct-to-card or retransfer printing innovation. Magicard offers an exceptional drop-in YMCKOK strip that can be added to any single-sided model to empower duplex printing. 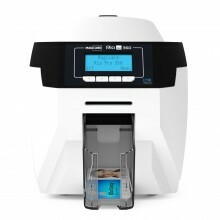 Magicard, a card printer industry pioneer, has a printer model to fit any ID card and identification program, Magicard separates themselves by furnishing a quality item with improved card security highlights and by giving the best help and guarantee in the business. 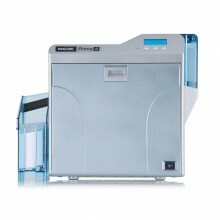 Magicard ID Card Printers are worked to last. Simple to-utilize and exceedingly secure, the line of Magicard Printers will meet every one of your prerequisites. Superior quality single or double sided printing; Fast, strong and simple to-utilize; Free security highlights for special identifications; Mac-compatible ID Card Printers. You can contact us at ID Management System, for consultations with an ID expert, for more information. 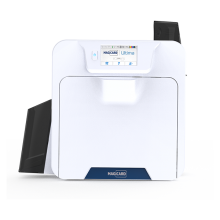 Magicard offers a wide choice of ID Card Printers, from entry level low-cost solutions right through to high security printers with numerous encoding options to choose from. We pride ourselves in being able to offer diverse technological options, suitable for an extensive range of applications; the Magicard range is able to offer this and more. 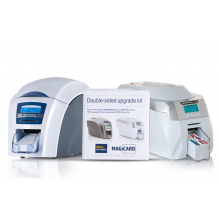 Our Magicard products are available as Single Sided and Double Sided models, including countless variable features (Magstripe and Smartcard Encoding, Re-Write Technology, Edge to Edge and Barcode Printing). These products are ideal for those who wish to print in mid to high level volumes; many models contained on this page print up to or in excess of 10,000 cards per year. Provided with each printer is free Cardpresso XS software, worth £34.49. In regards to the printing of basic ID Cards, this software enables the user to do everything they require, also giving the user access to predefined templates for basic card designs. Should you require access to addition software capabilities however, check out our Cardpresso Range and Software Datasheet. Magicard's unique HoloKote and HoloPatch features allow you to produce secure cards at very affordable prices and the Ultra Cover warranty is assessed as the best in the industry, meaning that all models are provided with at least a 2 year manufacturing warranty. All models are provided with at least a 2 year manufacturing warranty. 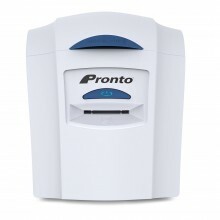 Along the right hand side of these product listings are compatible consumables and products, as ID cards, printer ribbons and cleaning kits that will make it easier for you to determine what products you may require with your purchase. If you require any additional information regarding this range or would like to the compare specs of multiple models, call us on 0800 408 1471 or email [email protected], and one of our highly trained sales members will be able to assist.